As you may know, Corning was not the only company to produce glass-ceramic cookware. Oh, make no mistake, Corning invented and perfect the process of glass-ceramics. It was Corning that manufactured pyroceram missile radomes and they were first to market a glass ceramic cookware. However, Corning Ware was such a hot product that other glass manufacturers had to jump on the bandwagon. One of the ones that most people are not familiar with, however, is Libbey glass's version of glass ceramic cookware made out of a material called Cer-Vit and sold as "Libbey Ware". CerVit was a product of Owens-Illinois Laboratories, and their Libbey glass division was the chosen outlet for the cookware. The Cer-Vit formula, and variations there of, was also used for various other scientific applications. The name "Cer-Vit" is a play on the words Ceramic and Vitrification. 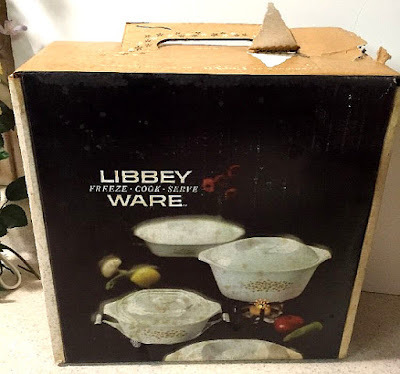 Libbey Ware hit the market sometime around 1962 and sold up until about 1966. Owens-Illinois more than likely discontinued Libbey Ware production due to the lawsuit that Anchor-Hocking was engaged in, with Corning Glass Works, for patent infringement. After all, if you are eventually going to enter into a joint venture with Corning Glass Works (Owens-Corning) it's best not to poke the bear. The only pattern I have seen in "Libbey Ware" is the Brown Daisy. The shape is a little strange, almost an oval, but not quite. The bottoms are marked very simply with Libbey and, in this case, 1 quart saucepan. Pieces that have surfaced to date are the 1 quart saucepan (above) as well as 2 quart and 3 quart saucepans. There are 8 inch & a 10 inch skillets. And a 2 quart Casserole which is wider than the saucepan, with lower sides. Is is also marked as an actual "Casserole"
Here are the 2 different 2 quart pieces together. 2 quart Saucepan on top and 2 quart Casserole on the bottom. There still may be other pieces out there, that have been unaccounted for. I am thinking there is probably some sort of 13x9 inch roasting pan out there somewhere. The lids are shaped a little bizarrely and have white ceramic knobs that appear to be "riveted" on, but they are not. The "rivet" is actually a flat headed screw. The handle has an interesting streamline shape that is surprisingly comfortable in the hand. Simply place it on the dish lug, and flip the switch forward to lock. They are marked on the underside with the script L within a circle and the word "Libbey". Where is your Libbey Ware?? I have a 10 inch skillet - no lid. Does skillet mean I can use it like a frying pan? I just passed one up yesterday at the thrift store..no lid. The first few that I found, and left, in the thrift stores were lidless as well. Because of their weird shape and short duration of manufacture, finding pieces with their lids intact is a must.